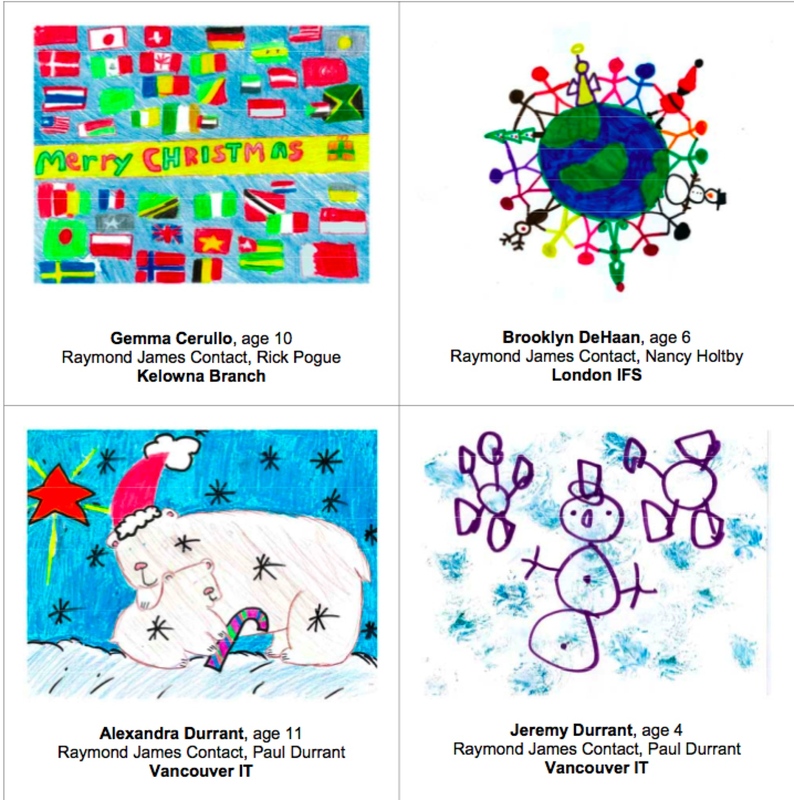 Raymond James held a Sharing the Holiday Spirit Greeting Card Contest to design cards for this year's holiday giving season. They had more than 135 entries from children − ages 2 to 12 years old − who are related to and/or friends of their people right across the country. 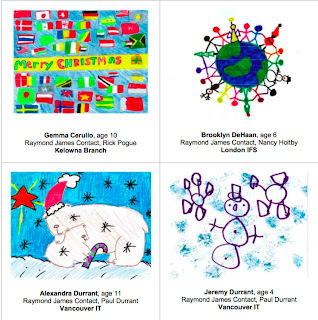 This year again all proceeds from the sale of the cards will go to support Sleeping Children Around the World. Last year, they raised nearly $8,000 which went to Sleeping Children. This year, through the help of their young artists, they hope to surpass this amount. At right are a few of the cards that won the contest. Thanks to Warren Wagstaff in Vancouver for letting us know about this campaign. You can click on the graphic or this link to enlarge the poster. Sleeping Children Around the World is helping dreams come true. Using $30 donations, the non-profit organization has delivered kits to children in underdeveloped countries since 1970. This year, the organization travelled to the Phillippines and team leader Kettlebly resident Ken Graham, led the way. “I give the people credit for the attitude they have,” Mr. Graham said, speaking of the thousands of people who lost everything during the catastrophes in the Phillipines. After an eruption of Mount Mayon in 2006, followed by a vigorous typhoon just months later, the citizens of the Bicol region were left with almost nothing. All waterways were blocked and coconut production, a staple industry in the Phillipines, was left in tatters. Since these events, the group has delivered thousands of kits to children in the Phillipines. “It’s unique that 3,000 of the 5,000 bedkits went to people who lost everything from the volcanic eruption and the typhoon,” Mr. Graham said. For this trip, bedkits included clothing, school supplies, a toothbrush, bath towel, mosquito net and bedding, among many other household necessities. “When the kits (are) handed to the children they smile. They take your hand and put it to their forehead as a way of thanking you,” described Mr. Graham. 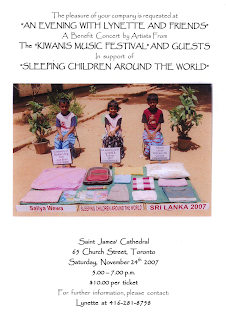 The children are also photographed along with their bedkits which is sent to each donor. “The No. 1 main purpose is that they're able to go to school,” said Graham. He also emphasizes the country has improved over the past 10 years since the increase in employment and industry. But there is more room for improvement. Mr. Graham recounts people building shelters under mango trees after their dwellings were destroyed. “The basic philosophy is that education is probably going to do more to improve their own standard of living,” Mr. Graham said. The organization will return to the Phillipines early next April. Gloria Hogan interviews travelling volunteers Carl and Pat Dickey about Sleeping Children Around the World and the display that will be at Heritage Mall on November 16 and 17. On Daytime, Rogers Television, Owen Sound.